Treten Sie aus Ihrem Hotel und betreten Sie den Fiat 500 für den Tag. 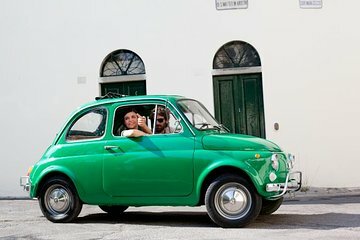 Diese einzigartige geführte Tour ermöglicht es Ihnen, die Toskana über einen Oldtimer Fiat 500, ein beliebtes kleines Auto, zu sehen. Mit zwei Personen pro Fahrzeug und nur fünf Fahrzeugen sorgt diese Kleingruppentour für viel Aufmerksamkeit des Guides. Nachdem Sie sich hinter das Steuer gesetzt haben und dem Stil Ihres Reiseführers folgen, begeben Sie sich nach Monteriggioni, einem beeindruckenden ummauerten mittelalterlichen Dorf. Entdecken Sie die Kleinstadt, besuchen Sie die Stadtmauern aus dem Mittelalter und stöbern Sie in kleinen Geschäften. Steigen Sie wieder in Ihr Auto und fahren Sie weiter, fahren Sie durch die klassischen Hügel der Toskana, erleben Sie die mit Weinreben bewachsene Landschaft und die Hügel, die von rustikalen Villen gekrönt werden. Fahren Sie zu Poggio Amorelli, einem lokalen Weingut, und gönnen Sie sich ein herzhaftes toskanisches Drei-Gänge-Mittagessen, zu dem natürlich auch eine Weinprobe gehört. Später starten Sie den Fiat 500 erneut und treten Sie mit dem Pedal zurück nach Monteriggioni. Nach einem kurzen Stopp fahren Sie zurück nach Siena, um Ihren Tag im italienischen Automobilstil zu beenden. One the best tours you can possibly get! My guide Michele( Michael) is a perfect gentlemen with extensive knowledge of history and culture for this region. You couldn’t get a better guide even if you try! The tiny car is Super cute, Michele drove me all day and we had a incredible jouney. Must try! Agree with other reviews that the book in process and getting going could have been faster. Not sure that the Fiat would have passed a roadworthy test - no working speedometer or mileage counter, very spongey brakes and were told not to worry about using seat belts. However we had an absolute ball folding ourselves into the tiny car and winding through the hills. The tour guides were great - friendly and knowledgeable and were able to converse with the group in several languages. It was an amazing experience not to be missed and the scenery was spectacular! Wonderful! Fun little cars, and a great day. Our Fiat 500 tour from Siena was a lot of fun. However, when we went to collect the car we were given one with the seatbelt held together with a knot in the belt to hold the clasp on. I said I wouldn't accept that as it was not safe. After a bit of a hullabaloo they finally gave us another car. We were the only car on the tour which was good in some respects but would have been more fun with more cars and people. Our guide Sergio was excellent and showed us around the area - he was a lot of fun. Great small group. Fun guide. Fabulous scenery. Unique experience. Only suggested improvements: speed up prep time at company so can get started quicker winery just OK -- not super scenic and food on plastic plates not very authentic or special. Tour leaders are great and knowledgeable, we have excellent exposure thru out the whole tour. Self drive service is great, we have a lots of fun and experienced the vintage fiat 500. Lots of laughs driving a 500cc, 24hp Fiat.... lost a race with two Vespas and a pedestrian! The scenery was breathtaking, the wine tasting wonderful. Our guide was careful and courteous. I'd take this tour again just to enjoy the Tuscan countryside.